We finally emptied out all the bags of stuff we got at Blog Paws. Annie of course was beyond excited. So I said that we need to figure out how to split it up. Annie barked that I can have all the spa bath products and she will take all the treats. Why am I not surprised? OMC! LOOK at all the wonderful loot. We don't think you could be any lovelier than you already are, Rosy, but we bet you'll have lots of fun being pampered at the spa. Hopefully Annie will share the treats with you. Otherwise, she might need to go to a spa, too...a fat far...um, we mean a slimming spa! Yes! I also suggested that Annie share some of those treats. She said she would try hard to save some for her friends. We'll see how much will power she has! RosyPoodleKisses! Wow Rosy sure looks like you got a lot of swag! It looks like there is enough for both of you to get your fair share of treats. I do imagine you enjoy the spa stuff more than Annie, so that part made sense. 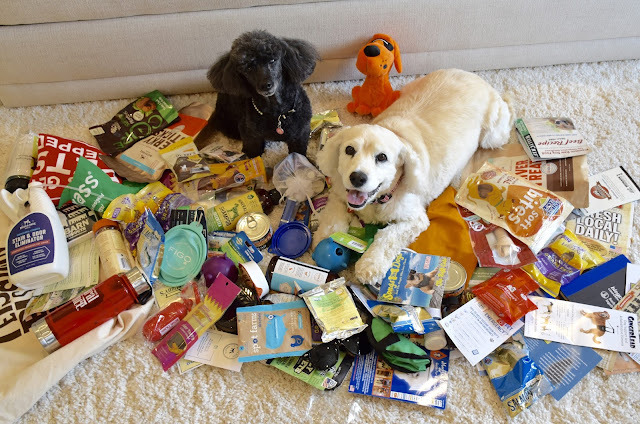 Looks like blog paws was a fab time for you girls! Did Mom have fun? Annie said she would let me sample some treats ! We LOVED BlogPaws! And so did Mom! So many like minded people in one place! RosyPoodleKisses!